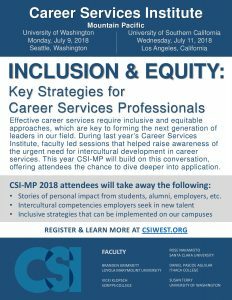 We invite you to consider the Summer 2018 program: Inclusion & Equity. 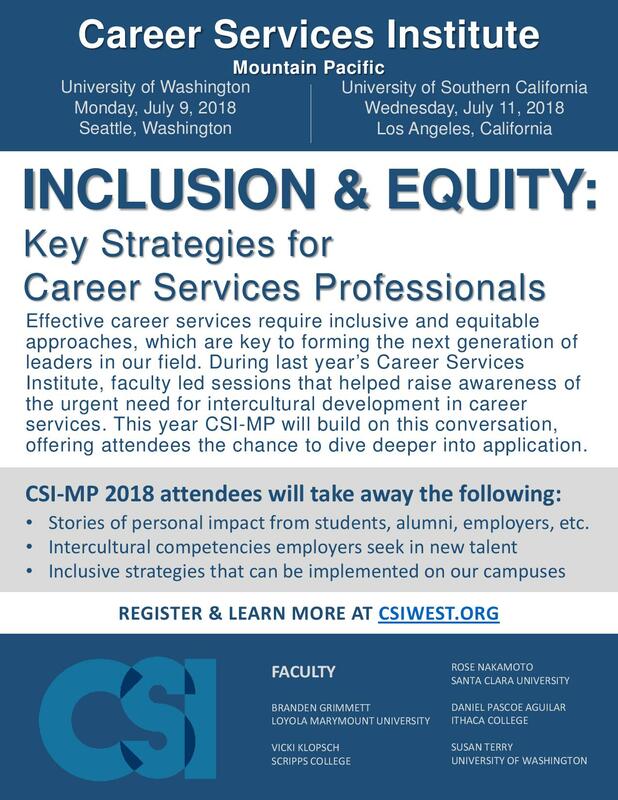 The CSI faculty encourage you to take advantage of these opportunities to build your skills and networks, while renewing your commitment to serving students and employers. Join us for a day of exploring and developing strategies at the low-cost of $199. Click here to see the info on MPACE's website. Come join a discussion on Inclusion & Equity and hear stories of impact from students, alumni and employers! Intercultural Inclusion and Equity in Career to gain a better understanding and supporting the career development needs of marginalized communities! Traditional Teaching May Deepen Inequality. Can a Different Approach Fix It? Post a job for free that will be shared with CSI West community. The sessions were great! It is so helpful to be in a room with colleagues who understand the unique role we play. This experience renews & reaffirms my purpose in our wonderful profession! Thank you – well organized, thoughtfully constructed for a wide range of professionals. For a new person in the role of employer relations...I found the breakout sessions and speaker to be very informative. I walked away with new resources, friends, and ideas. Great, affordable professional development opportunity! Thank you! Content Copyright © 2019 Career Services InstitutePlatform and Design Copyright © 2019 uConnect, Inc.